The Sierra Designs Crew at Mirror Lake. 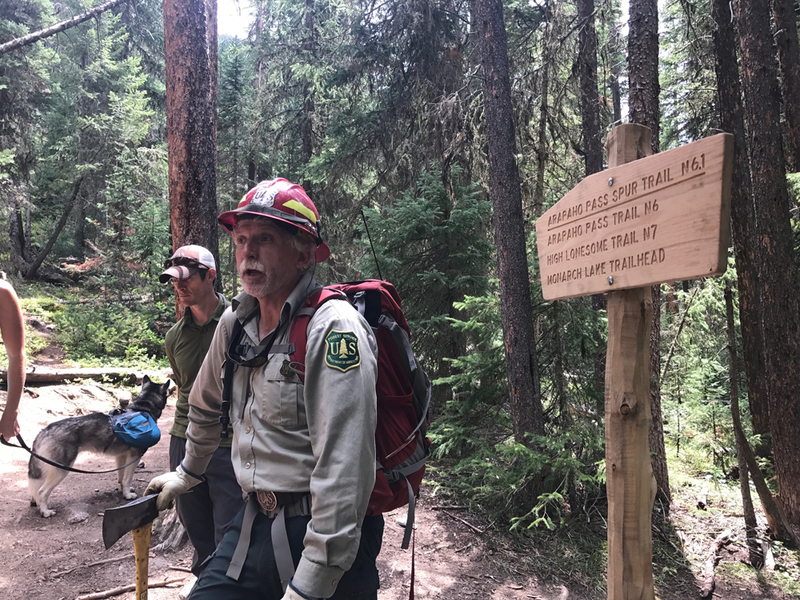 Earlier this month, I had the opportunity to explore part of the Indian Peaks Wilderness together with Sierra Designs, famed ultrarunner Andrew Skurka, and a handful of like-minded editors. Our goal for three days of backpacking was to follow part of the 78-mile Pfiffner Traverse, complete with a full day of off-trail bushwhacking adventure to climb up and over the knife-edge Paiute Pass. Our trip began in the quaint town of Golden, Colorado. While loading up our Sierra Designs Flex Capacitor packs, Andrew gave us a few packing pointers. As the weather forecast pretty much guaranteed we were going to be rained on every day, he showed us how to line the bottom of our packs with trash compactor bags to keep our sleeping bag, pad, and warm clothes dry. For the rest of our gear, a couple of dry sacks and some Ziplocks did the trick. Chatting with the ranger outside of Monarch Lake. With 10 people and two dogs in tow, we headed off on the Cascade Creek Trail, slowly winding our way up through the forest before merging onto the steeper Buchanan Pass Trail towards Thunderbolt Meadow, roughly 8 miles in and our destination for the night. A little bit of rain didn’t stop us from building a bonfire and roasting s’mores before crawling into bed. Thunderbolt Meadow after a night of rain. 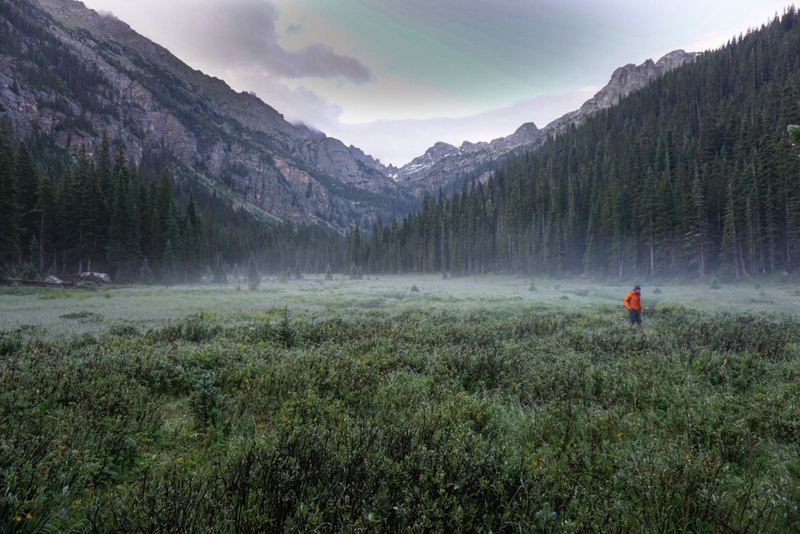 The next morning, we awoke to an incredible mist hovering above the meadow, flanked on all sides by the jagged mountains of the Continental Divide, no longer obscured by heavy rain clouds. Way off in the distance, we could see our objective for the day — Paiute Pass. After fortifying ourselves with copious amounts of coffee, we took off deeper up valley, following the edge of Thunderbolt Creek, hopping in and out of the trees to avoid massive blow downs. A stint of bushwacking through waist-high wildflowers brought us to the end of the valley where the real fun started. From here, the route to the pass headed straight up in three tiers — the first through a thick mossy forest with cascading waterfalls that lead to the second tier of grassy rock ledges before dumping you out at the stunning Paiute Lake, a great place to stop for some lunch and maybe a swim if you are feeling brave. Another stint of bushwacking lead to the crux — a fun Class 3-4 scramble straight up a gulley to Paiute Pass. 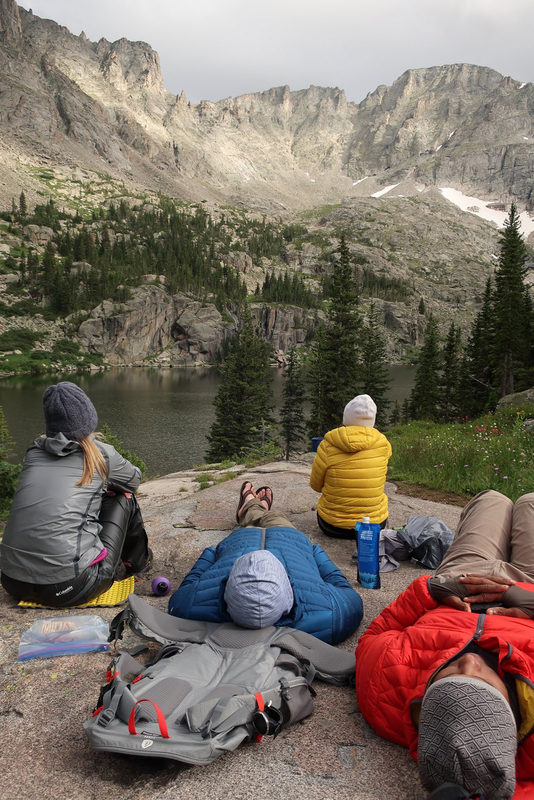 From the top of the pass, we were rewarded with sweeping views of the Pawnee Lake basin and along the ridge of the Continental Divide. It was breathtaking. With no obvious way off the ridge and a thunderstorm rolling in, we quickly started picking our way down through the boulders, talus, and scree on the opposite side of the pass — easier for most of us than the dogs but with a little help, they were super troopers. Hanging out at Pawnee Lake. 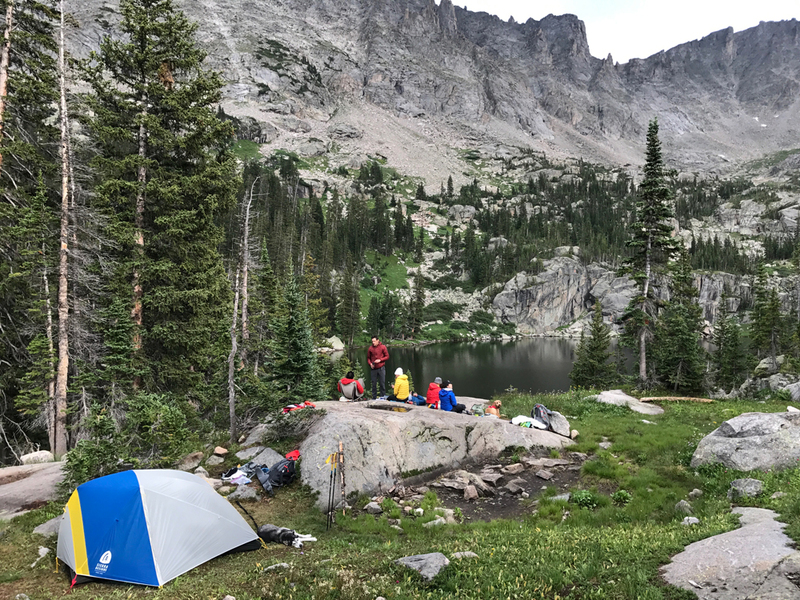 We made camp at Pawnee Lake for the night and cooked up some rice and beans under the on and off rain while gazing across to Mt. Toll and Pawnee Peak. For an area a short drive from Denver, there was not another soul in sight. 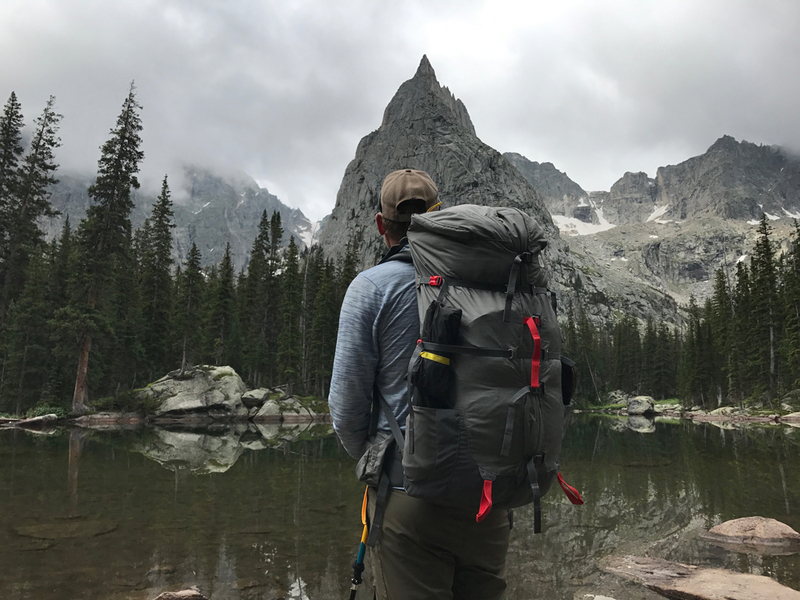 After a night filled with rain, we all awoke early for our hike back out to the Monarch Lake Trailhead, but not before a side trip to Mirror Lake with its unforgettable view of the prominent Lone Eagle Peak. I made up my mind then and there than I need to go back and climb that peak someday. By the time we returned to the trailhead midday, we had hiked 22 miles with around 7,000-feet of elevation gain. 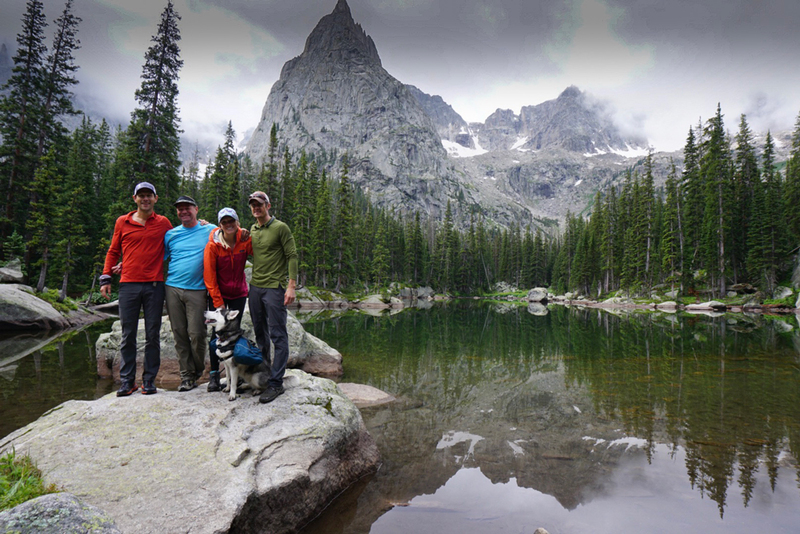 Not quite the 78 miles with 30,000 feet of elevation gain of the full Pfiffner Traverse, but it served as a great sampler and incentive to come back and explore more of the Front Range wilderness. Flex Capacitor in front of Lone Eagle Peak. Sierra Designs Flex Capacitor Pack: These sub-three pound packs feature a unique gusset system that allows the pack to quickly and easily expand from 40 liter to 60 liters with the adjustment of a few straps, giving you plenty of room for that extra bag of wine or box of s’more making material. Instead of expanding up like other packs, the pack ingeniously expands outwards, making for a much more stable and comfortable ride. The pack can easily carry loads of up to 70 pounds. For organization, you get six external pockets including two large hipbelt pockets and a removable hydration sleeve. The Flex Capacitor Packs retail for just under $200 and are available now. The High Side Tent in action. 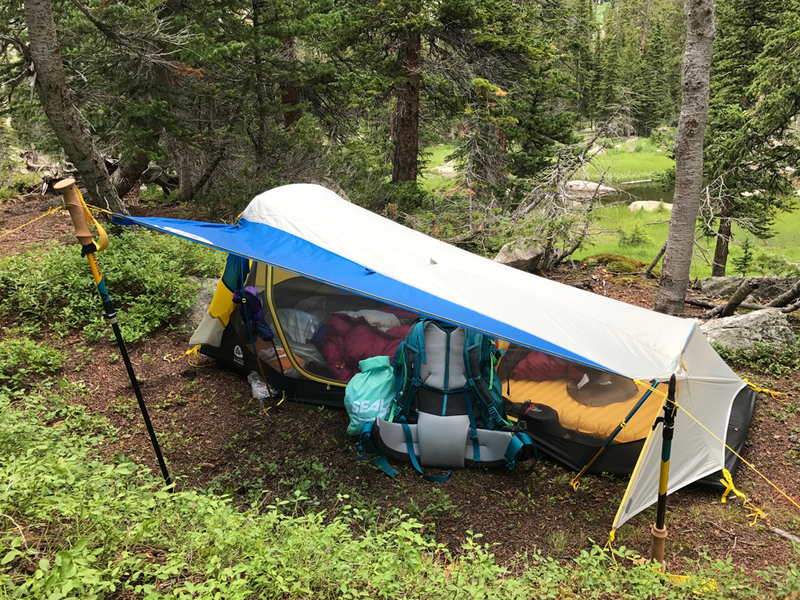 Sierra Designs High Side Tent: I was super excited to test this tent out as it is perfect for fast and light solo backpacking and bikepacking adventures. Weighing less than 2 pounds, this non-freestanding tent sets up within minutes, first by staking the base and then erecting the two pre-bent cross poles — one at the head and one at the feet. The fly Velcros to the poles and hooks into the footprint of the canopy. You can further stake out the fly for protection in inclement weather. We got poured on each night and I never had a problem with water entering my tent. I did get condensation on the inside of the fly but it never dripped through the mesh canopy. 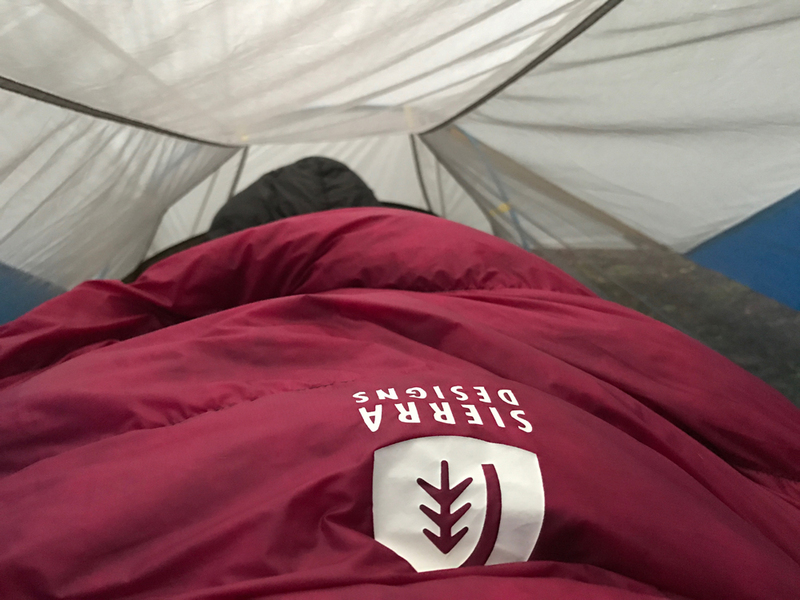 My sleeping bag was completely dry each morning — a pretty good indicator of plenty of ventilation. The door of the fly unzips on two sides to fully reveal the single full side door of the canopy. Instead of rolling open, the door can be stacked either using trekking poles, trees, or even your bike to create an awning. 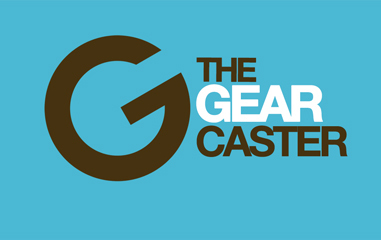 This is great for storing excess gear and for making coffee from your sleeping bag. The one bummer — your ab muscles get a bit of a workout as you can’t fully sit up. This is not a big deal if you aren’t planning to spend tons of time in your tent but it does make getting dressed and climbing in and out of your sleeping bag a bit of a project. The High Side tent retails for $280 and will start shipping next spring. Sierra Designs Cloud Sleeping Bag: This new zipperless sleeping bag offers the same functionality of the ultra comfortable Backcountry Bed but in a more traditional mummy shape. The oversized integrated comforter includes a unique shoulder pocket that gives it flexibility to move and expand while sealing out drafts. The base of the bag includes a sleeping pad pocket so that as you roll around at night, you are rolling inside the bag, not with it. The bag is stuffed with 800-fill DriDown and features a hidden, zipperless foot vent should you get a bit too warm in the middle of the night. Another Spring ‘18 product, the Cloud comes in both a 35-degree and 20-degree version for $270-$300. Chilling in my rain gear. Rain Gear: I brought along the new Columbia Montrail OutDry Ex Caldorado Shell and Columbia OutDry Ex Stretch Pants for Spring ‘18. Rain gear is essential not only for protecting yourself from rain but keeping dry as you bushwhack through waist high growth. I had zero overheating issues with the new OutDry Ex Stretch Pant — pretty impressive for waterproof pants. La Sportiva Akyra: These trail shoes are super nimble with great grip over any terrain. Never once did I feel unstable, even when climbing up and down Class 3-4 terrain or over carting heavy loads over wet, muddy trail. Stove: I brought the MSR Pocket Rocket 2 coupled with the Keith Titanium Multi Cooker to cook all my meals. The stove and a 4-ounce gas canister nestled nicely inside the pot for compact storage in my pack. Sucking on the Trail Shot. Water Filtration: We used a Platypus Gravity Filter for camp a couple MSR Trail Shots along the trail each day. 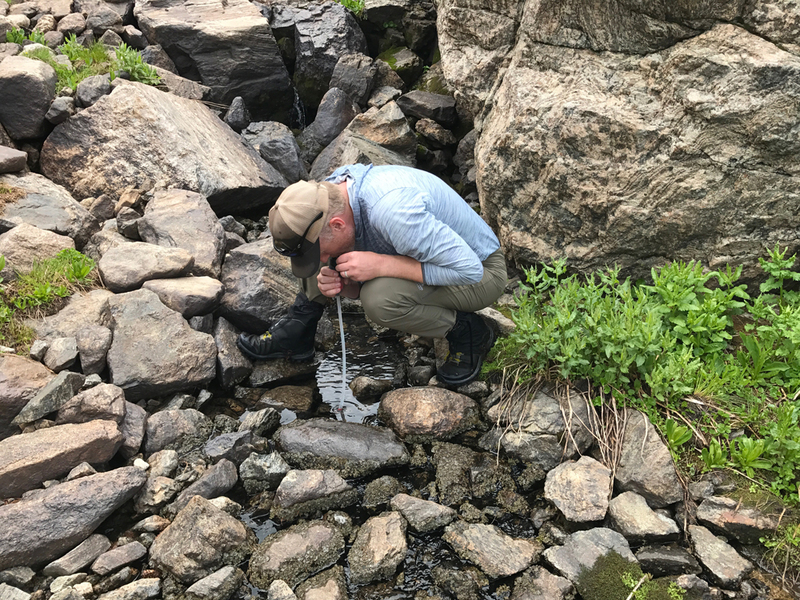 As we were constantly hiking along a creek or had access to a lake, we had no need to carry more than one liter of water with us at any time.